Some people wondered why I was taking an eight-year-old boy to a foreign country. Some people were surprised I was taking my third-grade boy. Some people encouraged me to take Ben. 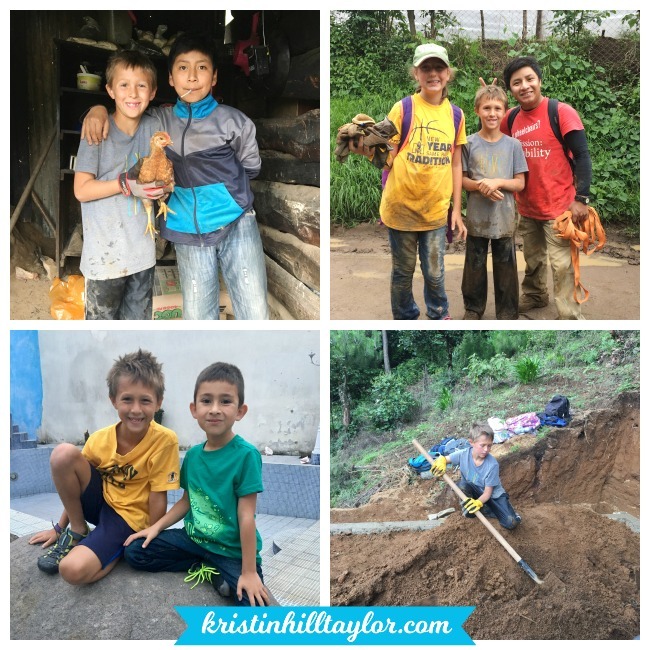 I’m here to say, I’m glad I took Ben to Guatemala for a week-long mission trip. Cate, who is now eleven, went with Greg and me in 2015. I always assumed when we went back we’d bring Ben. We debated on going last year but for various reasons I knew and others I still don’t know I knew we needed to wait. My momma heart thinks God may have been waiting for the right time for Ben. He’s a very different kid than Cate (what siblings aren’t, right? ), but I’m grateful he experienced this country we’ve come to love through our service. Honestly, while preparing for this trip, I struggled more with leaving Rachel than I did with taking Ben. In almost every way, having Ben with us was easier than I expected. He bravely connected with other kids with whom he didn’t share a language. But he shared suckers and gum and toy cars and Legos. Ben takes medicine twice daily and he was on an antibiotic to heal the infection that had to be drained from an abscess just a couple days before we left. So I brought a bag of medicine for him and included other things I thought we might need. Turns out we needed the ibuprofen and a teammate’s Tylenol after Ben tripped and fell into a pool without water on our last night in Guatemala. He landed with his knee twisted and we really thought it was messed up. It swelled and he hurt. But then he woke up ready to walk on it. We consider that a miracle. We also were relieved he didn’t fall down the mountain where he chased chickens in moments between helping us build a home for a family of seven. We loved seeing him bond with Marvin, who works with Bethel Ministries International, and Joshua, whose birthdate is two days before Ben and who is the son of my missionary friend Hannah. We loved to see his smile help others smile. Really, living with Ben shows me ordinary miracles regularly. He’s spunky and adventurous. He’s brave and curious. He’s sweet and remembers more than anyone thinks he does. He finds joy in everyday moments. His strengths are my weaknesses. God uses my boy for my good and the good of many around him. That’s why I wanted to take him to Guatemala. Plus we believe in serving as a family, so as a family we go wherever God leads us. 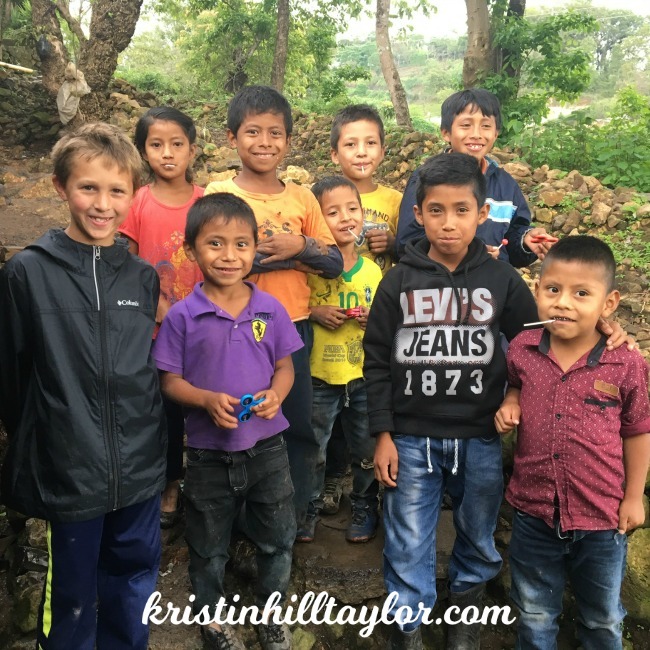 This is the third post I’ve shared about our mission trip to Guatemala. You can read about what God showed me about intentional sacrifices as well as seven ways to serve missionaries. I’ve got another post or two brewing, so let me know if there’s a specific aspect of the trip you want to hear about or questions I can answer. Hey, #PorchStories friends! You may have noticed, I started publishing this weekly linkup post a couple hours earlier, so now it’s live at 4 a.m. central time. I know some of you are early risers, so I hope that’s helpful! Kids are so amazing, and it seems as if your little guy has been introduced to the wonderful privilege of serving God by serving others. Thanks for sharing the journey here! Thanks for being here with me, Michele! Kristin, kids have the most amazing way of growing us mothers up 🙂 Thank you for sharing your stories with us all. And I am so glad Ben was OK. May God use this experience in ways yet unknown in Ben’s life! What a wonderful experience for your family! Your son is blessed to have parents who know what he needs to help him grow into a man after God’s own heart. Well, thank you. Some days I doubt myself. But I’m thankful God is always teaching me. Thanks for being here, Debbie! great photo! ben will never be the same! That’s my hope! Glad you’re here, Sue! They sure are! And Jesus always knew what he was talking about. 🙂 Thanks for being here, Tara! Yay Ben!! This is so awesome Kristin. I love how you didn’t let anything hold you back but were content to choose a different time line with him as well. So proud of him for going – that’s a big deal. I love how your family is serving together. So how did Rachel do back home? Ben is SUCH a blessing in my life! He brings me a great amount of joy when I have the opportunity to be around him. Give him hugs for me! We are so grateful for your friendship with him (and the rest of us)!